Agra Tech heater hanger mount kits are designed so the heaters can be hung from the truss or arch. Heater hanger kits are designed for Modine heaters. If using other heater manufacturer, please send specifications for proper mount. One or more horizontal 2 7/8” diameter x 12’ bar with webs and hardware to attach to the structural framework. All-threaded rods are included to attach the heater to the horizontal bar. Design allows Agra Tech’s Slope-Flat-Slope curtain to travel over the heater. One or more horizontal 2 3/8” diameter bar x 4’, 6’, or 8’ to match arch spacing and to provide adequate clearance from endwall. Webs attach the bar to the greenhouse structural framework. Specify arch spacing when ordering. Mount does not allow curtain to travel over the heater. 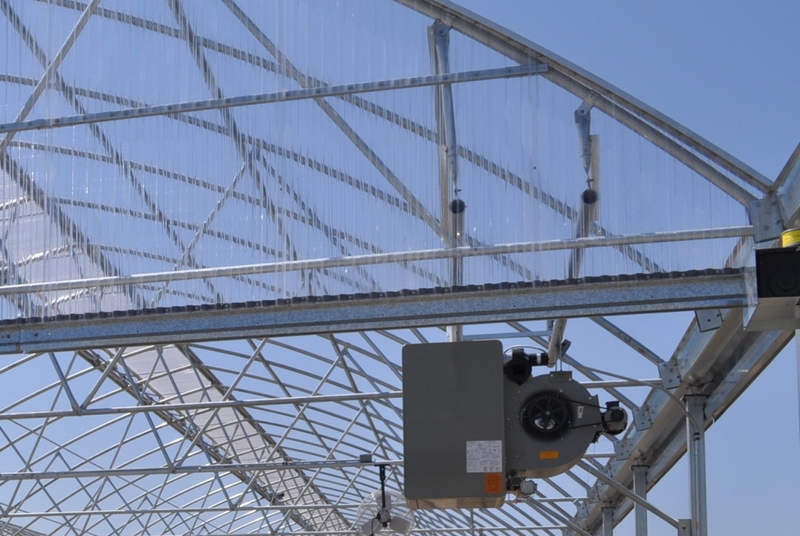 Lack of space can be a problem in today’s greenhouses. Agra Tech sales engineers can help with integration of the structure and equipment. Be sure to allow adequate clearance to meet minimum distances to combustibles and for other equipment operations. Each heater hanger is designed to support the weight of the heater. However, the structure may require additional support to the ground. This problem usually only occurs with small non-code structures using large heaters. Exhaust flue kits sold separately. To order, specify; Heater Model and size, Orientation of heater (wether it is to blow down the length of the house or across the width), Is heat to be circulated via Horizontal Air Flow Fans or Convection Tube. The heater hanger kits shown above are Agra Tech standard heater hanger kits. If you have a special project, please let us know and we can design something to suit your needs.